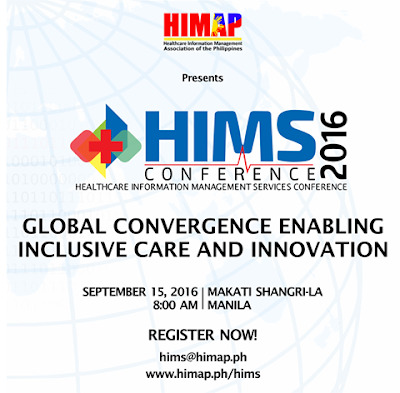 The Healthcare Management Information Association of the Philippines (HIMAP) presents: “The Healthcare Information Management Services Conference 2016” at Makati Shangri-La Philippines on September 15, 2016. The HIMS Conference 2016 with the theme: “Global Convergence enabling inclusive care and innovation” will feature top health advisors as well as international experts that will talk about the trends in healthcare system, healthcare solutions and the convergence of global market and local services and serves as a venue for industry players, training institutions, vendors, other stakeholders, and the larger business community to identify key factors and programs that will contribute to positioning the Philippines as the leading destination for quality healthcare information management services. The conference features BPM experts, healthcare professionals and experts in discussing how global convergence enables inclusive care and innovation in the healthcare information management industry. Hear it straight from the stakeholders and industry players as they share reactions and positions on the global and local trends as they relate to aspirations of inclusivity and innovation. Learn more about competitive success factors that HIMS business process management companies need to excel and stay ahead! Various technology trends in the healthcare outsourcing space (digitalization, internet of things, artificial intelligence, cyber security, workforce management tools, robotics automation, etc.) will undoubtedly create a world of seamless collaboration in information gathering, collation, analytics and dissemination. How should companies leverage on these technology trends to adjust business models that create higher rate of return? 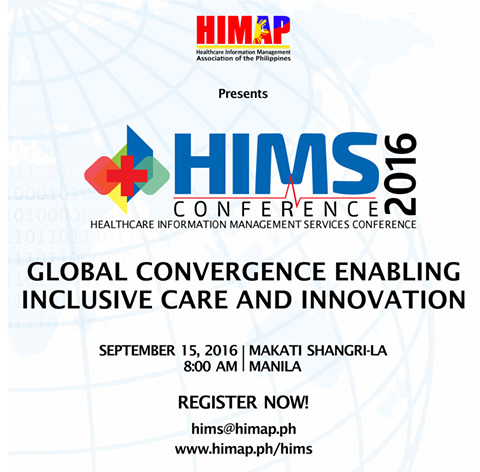 Register now at www.himap.ph/hims or email hims@himap.ph. For conference sponsorship packages and other inquiries, you may also reach us through hims@himap.ph and mobile numbers 09999673308 (Smart), for Sun 09427401472 (Sun) and 09176880144 (Globe).